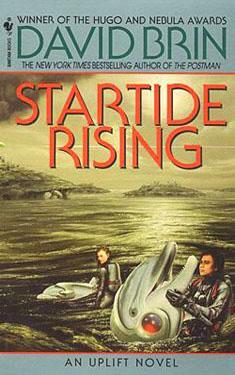 If you liked Startide Rising you might like these books. David Brin's Uplift novels are among the most thrilling and extraordinary science fiction ever written. Sundiver, Startide Rising, and The Uplift War -- a New York Times bestseller -- together make up one of the most beloved sagas of all time. Brin's tales are set in a future universe in which no species can reach sentience without being "uplifted" by a patron race. But the greatest mystery of all remains unsolved: who uplifted humankind? The Terran exploration vessel Streaker has crashed in the uncharted water world of Kithrup, bearing one of the most important discoveries in galactic history. Below, a handful of her human and dolphin crew battles armed rebellion and a hostile planet to safeguard her secret -- the fate of the Progenitors, the fabled First Race who seeded wisdom throughout the stars. Like Lost, but with Dolphins!